ABC analyses of products, customers and suppliers support JP Group’s strategy execution. This has resulted in a 30% lower inventory value, 31% higher turnover, 26% fewer dead products and a 3.8 percentage point increase in service level. Everyone talks about strategy, but nobody talks about executing strategy. A lot of resources are spent developing strategies, while generally there is little focus on supporting their execution. JP Group is doing something about that. “ABC gives us a common language and common goals across the value chain. …It supports our strategic objectives in a very practical and operational way.” So says Kristian Østergaard, executive assistant and member of the management team responsible for strategy and execution. “This is being done to ensure that everyone has a practical guide to how they can contribute to the strategy and business. ABC makes it very visible and easy for a lot of employees to see what they need to do and what difference their contribution makes. ABC is integrated with JP Group’s ERP and BI system. The company is doing something that not many other companies do, namely using ABC on all three dimensions: Products, suppliers and customers. JP Group uses double ABC for products and single ABC for suppliers and customers. In the customer analysis, JP Group combines mathematics and qualitative input from the sales department. “We combine mathematical analysis data and market knowledge as well as “the real world”, and it gives us a strong and operational basis for differentiating and prioritising daily operations,” explains Kristian Østergaard. The mathematical ABC analysis classifies the top 5% of customers as A customers, the next 15% as B customers etc. The company then makes a qualitative correction, with many customers “artificially” promoted to A or B code because they are in purchasing groups with some of the big players and therefore entitled to the same prices. “Purchasers and others use the supplier analysis as an easy guide to choosing the supplier that best meets JP Group’s needs. The message is clear: If at all possible, always choose an A supplier,” says Morten Mikkelsen Rieck. All departments concerned were consulted and given direct influence over how they would ensure that JP Group achieved its established strategic goals. “This created huge commitment and far better solutions than we could have come up with ourselves in the project group,” says Kristian Østergaard. 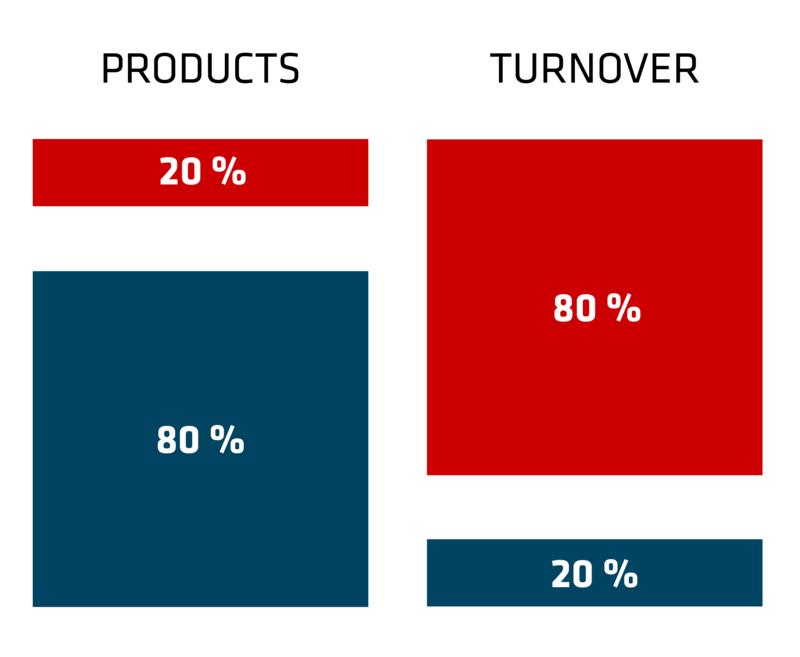 One of the main features of everyday life with ABC is Pareto’s 80-20 rule. So says Morten Mikkelsen Rieck, logistics manager and member of the management team. What products are contributing most to the business? Is our capital being invested in the right places? Are we always optimising the most important products? Are we negotiating the framework for crucial products? Is it necessary to keep all the products in stock? JP Group has generated a wealth of results since they started using ABC. JP Group is one of the ​world’s leading companies in the aftermarket. They produce and sell quality parts and accessories for European and Asian cars to approx. 1,800 B2B customers in more than 90 countries. They are 100% family owned and were founded in 1975. Their product range includes approx. 29,000 items from 450 suppliers, while JP Group also supplies exclusive parts and accessories for classic cars from VAG, Porsche and Mercedes-Benz. This article was first published in May 2017. See the original version in Danish here. The article has been reissued as the latest results underline JP Group’s expertise and SCM maturity. Copyright © 2019 ABC Softwork Blog. All Rights Reserved. The Matheson Theme by bavotasan.com.